The models in this box keep the high quality of detail we’ve seen from the models in the Dark Imperium box. 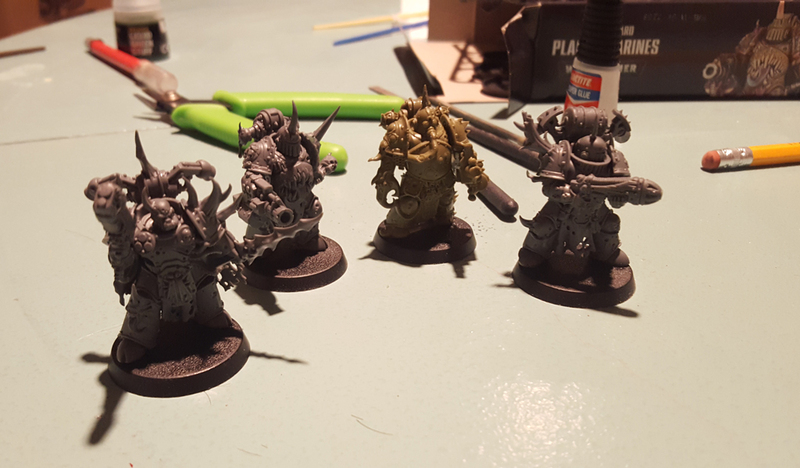 If you liked those models, then you’ll be happy with the aesthetic of the Plague Marine multi-part models. As with previous multi-part kits, there are also aesthetic options for some of the models. You can select from different chest plates on some models and different helmets and such. Again, all the options are really detailed and selecting one head over another won’t make the model seem out of place or break the theme of the squad. 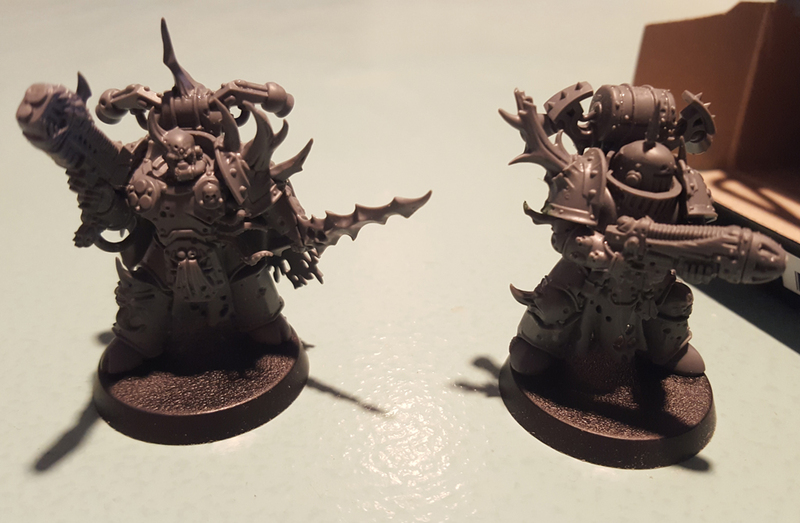 That said, there are some issues I have with the new Plague Marines. First off, while giving you nearly all the options for building the squad, the one glaringly left out is the plasma gun for the champion. It’s one of the coolest new rule options for Plague Marines, but it’s not on the table. My solution was to crib a plasma gun from the Raptor/Warp Talon box. The plasma gun there has a bit of mutation on it, so it has enough of the Chaos aesthetic not to look out of place. Another issue is the lack of flexibility with posing. Previous Chaos Space Marine models had at least some flexibility with which way the torso was turning, posing the arms, posing the head, switching up should pad options, and the like. Almost all of that flexibility is gone. Even in how you place the heads. That’s right – all the heads have a nub that goes into a socket in the torso piece, meaning the head is designed to face a certain way. Can you change these things with some conversion work? Yes. But some of the models will take a bit of converting, especially if you are trying to max out options with extra free bits you’ve either bought or traded for. I do understand why the posing flexibility is so limited. The models are so darn well-detailed it would prevent a number of poses if you were given the flexibility. So the new models make that trade-off: more detail and Nurgle-themed aesthetic for less flexibility in posing. I think that is a worthwhile trade-off as the current Chaos Space Marine models are showing their age and look rather bland compared to newer models in other ranges. And by newer, I mean models that are now 5+ years old. See the difference? The blight launcher on the newer model is clearly bigger, making the easy-to-build model’s launcher look… anemic. I do intend to use both models together, but I have to say that they look the odd pair. We’ll see how they look with the paint on them. I can report that I don’t see any other models that have that sort of disparity. The plasma guns are in line with each other as are the power fists and bolt guns. Overall, I do like the new models. 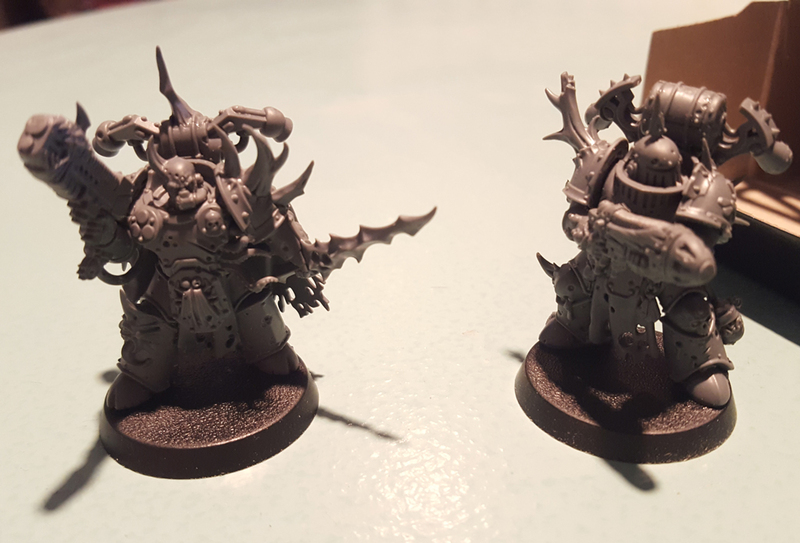 Much like the new Thousand Sons models, I think the new Plague Marines give the Chaos range an aesthetic shot in the arm. Hopefully Games Workshop won’t wait too long before updating the basic Chaos Space Marine kit. And those should be amazing models if the new Plague Marines are what to go by. ← What’s completed; and Happy New Year!